PT KAI Commuter Jabodetabek - PT KCJ or referred to as "KAI Commuter" is a leading and reliable transportation services company in Indonesia with main business competencies on commuter railways. Based in Jakarta, KAI Commuter is an commuter railways operator in the area of Jakarta, Bogor, Depok, Tangerang and Bekasi (JABODETABEK). PT KAI Commuter Jabodetabek is a key subsidiary company of state-owned railways operator PT Kereta Api Indonesia (Persero) or KAI Group. Currently, PT KAI Commuter Jabodetabek is owned majorly by PT Kereta Api Indonesia (Persero) with 99.78% shares and the rest is owned by Pusaka Foundation with 0.22% shares. In 2015, PT KAI Commuter Jabodetabek succeeded in posting overall improvement in its performance. KAI Commuter was able to expand total revenue by 39.96% from Rp 1,235.86 billion in 2014 to Rp 1,729.74 billion in 2015. 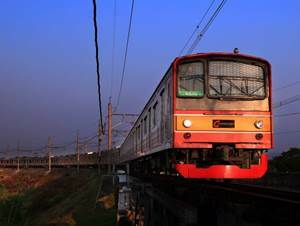 KAI Commuter booked a net profit after tax of Rp 254.12 billion, increasing 71% from net profit after tax in 2014 of Rp 148,28 billion, according to PT Kereta Api Indonesia (Persero) Annual Report 2015 as cited by JobsCDC.com. Male, age 18 to 30 years old. Minimum average national exam score of 6.5. For Civil and Building Engineering : mastering AutoCAD. For Mechanical Engineering : mastering drawing machine. For Civil Engineering : mastering AutoCAD and Corel Draw. For Engineering : mastering electrical work diagram. Male/Female, age 18 to 30 years old. Minimum 2 years of experience in document control unit. Able to create presentation material with Power Point format. Mastering grammar texts and documents. Minimum 2 years of experience in Good Corporate Governance (GCG) and whistleblowing system unit. Have an understanding of GCG Regulation. JobsCDC.com now available on android device. Download now on Google Play here. Please be aware of recruitment fraud. The entire stage of this selection process is free of charge. PT KAI Commuter Jabodetabek - SMK, S1 Junior Staff, Staff KAI Group February 2017 will never ask for fees or upfront payments for any purposes during the recruitment process such as transportation and accommodation.